Chosen by readers of 3D Printing Industry, B9Creations has been nominated in the 1st Annual 3D Printing Industry Awards as one of the most innovative, important and exciting enterprises in additive manufacturing. Rapid City, SD —March 27, 2017– B9Creations announced today that it has been nominated for Best personal 3D printer of the year in the 1st Annual 3D Printing Industry Awards. 3D Printing Industry asked their readers to nominate the most innovative, important and exciting enterprises in additive manufacturing. Voting for the “best” is now opened to 3D Printing Industries 1+ million readers. “B9Creations is honored to have been nominated for 3D Printer of the year! We truly appreciate the commitment and loyalty of our customers and followers.” – Shon Anderson, CEO of B9Creations. 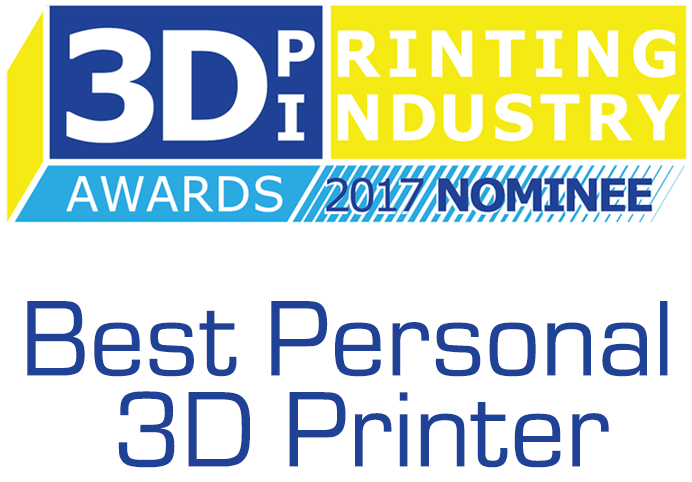 B9Creations asks all our customers and fans to help us win the top honor for Best Personal 3D Printer of the Year award. Vote for “B9Creator” in the Best personal 3D printer category at the link above. Winners of each category will be announced on Saturday, May 20, 2017 and honored at Chelsea Old Town Hall in London, UK. This event will bring together the best in 3D printing, 3D scanning and 3D design. Winners will walk home with a 3D printed metal trophy: designed by a member of one of the largest 3D design communities in the world. Delivering professional 3D Printing solutions to businesses across the globe while providing customers with production speeds, simplicity, and unmatched value.